Thanks to Adriano Zanni on Flickr. Interactive White Boards are here, whether we like them or not. Golly, if your classroom doesn't have one by now, I'd be real surprised. 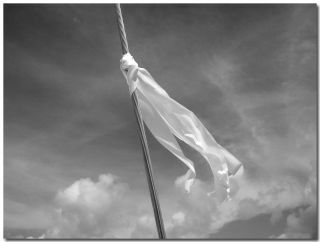 And while tech educators often rail against them (because teachers hog them), I've decided to throw up the white flag of surrender- for the kids. It would seem teachers aren't going to give these things up and let the kids use them. Ever. So we can either keep on fighting, or we can go with this, and just call this a "teacher" tool. If you're lucky enough to have a laptop cart for the students to use while you're on the IWB- then what is the difference? Think of it: how often did teachers let students actually write on the chalk board? The overhead projector? The fact is, there's only one Interactive White Board per classroom, and there may be 25 or more students. There is never going to be enough time in one class period to let everyone have-at-it on the white board. Nobody ever heard of a 1-1 white board environment. That would be awfully expensive. Maybe we're going about this all wrong. If you're still hogging it- and let's pretend for a second that you do- can we just accept that, and make it a useful classroom tool anyway? I think we can. I've been on a mission to make better use out of them, and I've discovered: they're not as bad as I thought they were. What is one of the biggest hindrances to learning when a teacher uses an IWB? Well, yes, they may hog it, but the bigger problem is that they're standing in front of it!Well, the solution to that is- screencasting. Record your lesson using Jing, upload to a proprietary YouTube channel, like this Mathademics Channel, and your IWB has now become the absolute BEST screencasting tool out there. 3. More economical in their language. Make the limit 5 minutes, and you have to get to the point. Take a look at this example, a mathcast on Greatest Common Factor. This 6th grade teacher seems very comfortable to me. I think this is for a couple of reasons. First, she's not teaching to a traditional class, where she would be projecting her voice a lot more. Second, she's not worried about blocking the workspace. Third, she's also using a headset mic, so the learning is very intimate- it's as though the students can hear her thoughts. They're hearing the think-aloud. How powerful a tool when you can stop, pause, and rewind what the teacher is thinking! The teacher in this example is aware this is a screencast, and this gives her the freedom to point things out, highlight a little bit more, maybe draw an arrow or a circle to point something out. She has to do this because the mode of delivery is different than if students were in a classroom. It reads differently at home or on a laptop. I think it frees her up. It's also visually interesting. It's a really great math lesson. Here's another example called Problem Solving with Coins. This 3rd grade teacher makes use of all of the IWB board tools, making a visually interesting lesson. Now, he involves the students, but they don't actually write on the board. Are we okay with that? He's engaged them in different ways. Well, first just listen to them- do they sound engaged? If he uploads quickly, the students can access the video almost immediately at the Mathademics Channel, and he can go around the classroom while they are working. He can be in 25 places at one time. Also since he's made it a screencast, they can access the recording at home later when they're doing homework. They can pause the video, rewind, and play it over and over again. This is engagement of a totally different kind, but it does something extremely important. It makes the IWB very useful, just not in the way that we've been reaching for these past few years. 1. Make their lessons visually interesting. 2. Make them accessible online for students to see and learn outside of the classroom. I believe that every lesson can be an artifact for student learning, if the teacher approaches their process as such. They can look at lessons as "episodes" of a TV show or scences of a large play. Shouldn't students should be able to access those episodes whenever they want to? Heck, if I can subscribe to all four seasons of Alfred Hitchcock Presents on Hulu, then I think my teacher owes it to me, the student, to make their learning accessible online. Do it with an Interactive White Board!